National parks will offer free admission on the final weekend of this month (Aug. 25-28) in honor of the 100th birthday of the National Park Service. Before then, the park service centennial is being celebrated with music. Southern Oregon’s Britt Orchestra and the Tacoma Symphony Orchestra are among more than a dozen arts organizations to commission original pieces for this occasion. 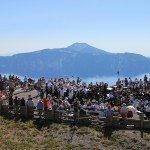 Correspondent Tom Banse has this audio postcard from a spectacular premiere at the rim of Crater Lake National Park. The celebrations continue here in Washington: a seven-member ensemble, Music In the American Wild, is touring national park sites in our state through mid-August. The group will play from a repertoire of new chamber music pieces representing the inspirations of eleven different composers.